P. Brown Jun. 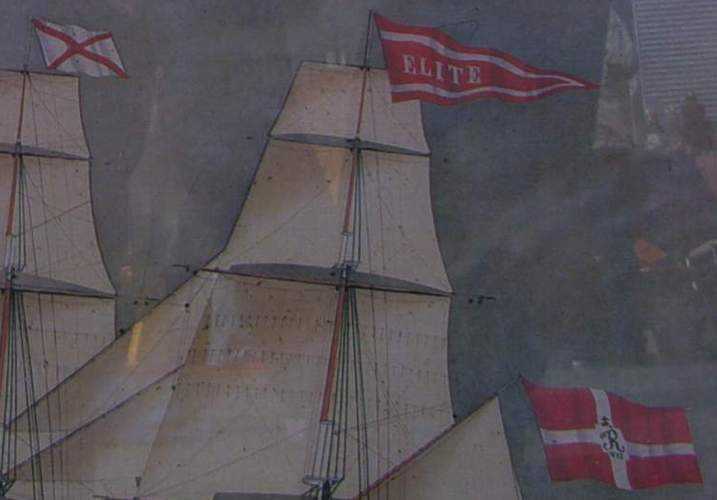 & Co.
Det Helsingforske Dampskibsselskab, P.Brown Jr. & Co.
Joseph Nüsse shows on his website colour pictures of several house flags of shipping companies. The site is a very good source since it shows pictures of *real* flags. It is clear from his website that Joseph served (and maybe still serves) in the merchant navy and most probably regrets the decline in merchant shipping. The website disclaimer says that most of the companies whose house flags are shown there have gone out of business. Probably the ship was trading with the mediterranian (cypher as distinguishing mark to Knights of Malta, although those had been already history then). Can somebody assist in order to identify the houseflag?